©2006, Cornell Southeast Asia Program. This article recaps the events that led to the ouster of Akbar Tandjung from the chairmanship of the Indonesian Golkar Party in December 2004. 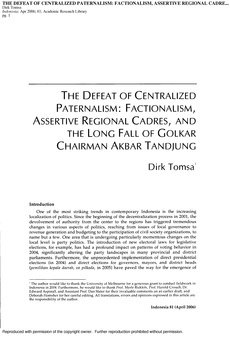 The author argues that the key to understanding the political demise of one of Indonesia’s most experienced politicians lies in Akbar’s apparent failure to comprehend fully the changing dynamics of electoral politics in Indonesia and to respond properly to the growing assertiveness of lower-ranking regional cadres from his own party.